The VoCALL CFVCRHS roaming handset is used along with the CFVCRJP jack plate, for emergency voice communication system installations in countries whose fire codes allow for roaming handsets (these units are not suitable for installation in the UK under BS5839 Pt9). 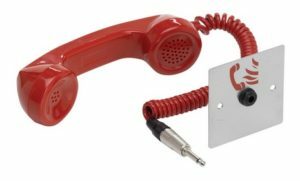 When used together, the roaming handset and jack plate form a type A outstation which is compatible with all VoCALL systems. Ideal for use in commercial buildings in the Far East and Middle East where standards allow.